On weekends, you can find me hanging out with butterflies at the Arboretum at Flagstaff's Southwest Butterfly House. We receive the butterflies in chrysalis form. Pictured above are the chrysalis of monarchs (top), zebra longwings (middle), and queen butterflies (bottom). Visitors are often shocked to see the different shapes and colors of these creatures in their pupa form. Below you can see a zebra longwing that has emerged from its chrysalis and has successfully pumped hemolymph into its wings and fully expanded them to their full size. To the right of this zebra longwing, is another longwing that had emerged after the first and still had wet and crinkled wings. Finally, to the right is a zebra longwing still in its pupa form, looking like a hanging bat and waiting his/her turn! I love the zebra longwings because they fly gracefully and are very social. They love to fly, roost, and eat together. Painted ladies are the butterflies that I see most in the wild, here in Flagstaff. They are widespread across the United States (and just about the rest of the world) and are often bred in the classroom for experiential environment education. Their under-wing looks quite different from the outer wing’s color and pattern. 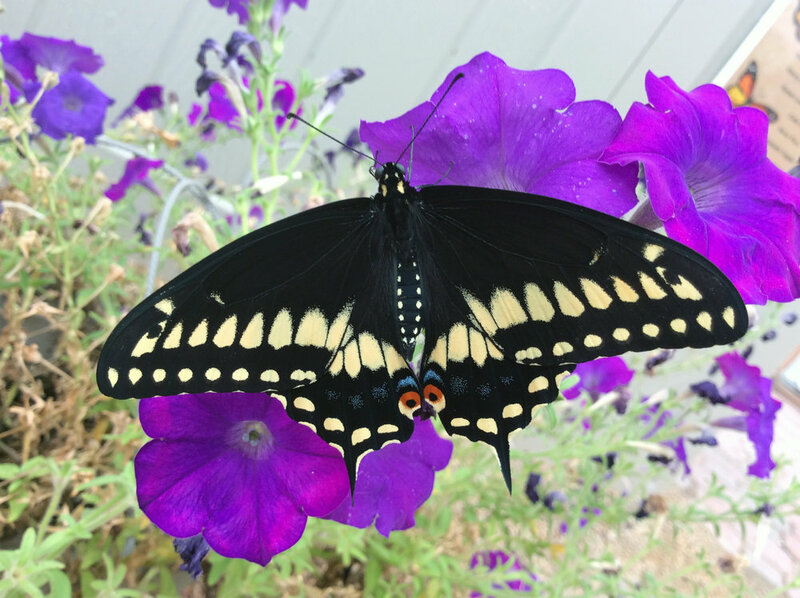 The swallowtails always get visitors excited--they are colorful and large. We have the black and giant swallowtails in the butterfly house and my observation of both are that unlike the zebra longwings, they like to do their own thing. Below is the queen (Danaus gilippus) and beloved monarch butterfly (Danaus plexippus), which are cousins---can you tell? I enjoy people getting excited about insects. Visitors are often surprised to learn about how briefly a butterfly lives (on average about 2 weeks) and are ecstatic when they happen to be present when a butterfly is emerging from their chrysalis. The butterfly house has about a month left before it gets too cold for the critters so visit while you can!